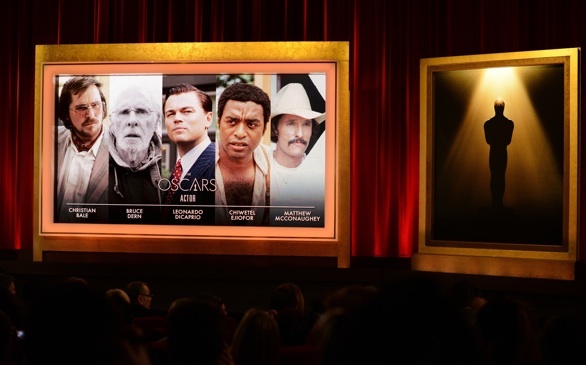 Oscar 2014 Nominees Announced: Who do you think will win? Who will win the lead actor category? In case you missed it (which is completely unacceptable if you consider yourself a movie buff), the 2014 Oscar nominations were announced Thursday morning! Some of the nominees were no-brainers, like 12 Years a Slave and Gravity for best picture, Matthew McConaughey (Dallas Buyers Club) and Chiwetel Ejiofor (12 Years a Slave) for best actor, and Cate Blanchett (Blue Jasmine) and Meryl Streep (August: Osage County) for best actress. However, there were some surprises. For example, Jonah Hill was nominated for best supporting actor (The Wolf of Wall Street), which we consider a pleasant surprise! On the other hand, Tom Hanks did not get a nomination for his role in Captain Phillips...we're still scratching our heads about this one. The 86th Academy Awards takes place on March 2, 2014. Ellen DeGeneres is this year's host.